Electric markets typically either allow customer choice—or they don’t. And what’s available to you is generally dependent on what state you live and/or operate your business in. In this post, we’ll delve into the differences between the two, how to recognize what you have, and the impact regulated and deregulated energy markets have on the price you pay for electricity. Regulated electric markets are home to vertically-integrated utilities that own or control the power plants that generate electricity, as well as all of the transmission and distribution equipment—such as the poles, wires, and transformers—that is used to distribute electricity to homes and businesses. In other words, you only have one option for your electric utility, who owns both the energy generated and the means to distribute it, and the rates your utility charges you are approved and regulated. What this ultimately means is that in a deregulated market, you have a choice of who to buy your energy supply from, as multiple and competitive retail electric suppliers sell electricity to the businesses that use it. You pay these retail suppliers what’s often referred to as the “supply” portion of an electric bill. Competition affects the retail price you pay for your energy supply. Which also means that as a customer in a deregulated energy market, you often see two bills: one from the competitive supplier (who is deregulated) for the supply portion of energy (typically measured in kilowatt hours) and one from your distribution utility (who is regulated, and who bills you based on an approved utility tariff) for the deliver of the energy you purchased. Natural gas markets operate in this way as well. Not every state is deregulated. The map below shows which states offer competitive supply, and which ones don’t. States that are deregulated offer a combination of deregulated electricity, gas, or both. Deregulation began in the 1970’s with the passage of the Public Utilities Regulatory Policy Act, which created an environment and structure for Independent Power Producers (entities that are not public, i.e. 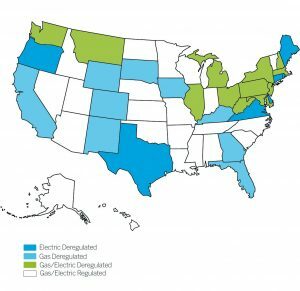 regulated utilities, but who do own facilities to generate electric power that they can then sell to both other utilities and to end users—aka us). However, deregulation didn’t really get started until the 1990’s when the Energy Policy Act of 1992 eliminated restrictions on the prices of wholesale electricity. The trend towards deregulation slowed around 2000-2001 during the California energy crisis (remember the Enron drama?) that gave many states concerns over the potential for market manipulation when becoming fully deregulated. We typically find commercial entities can procure cheaper electricity in deregulated states where they have a choice of supplier. Customer choice also offers many other benefits, such as the ability to structure different types of contracts (i.e. one-year vs three-year fixed prices, time-of-use contracts, etc.). If you are in a regulated state, however, there is still a lot you can do to gain more control of the supply side of your energy. You can still monitor your energy data, focus on reducing consumption and demand, and make sure you are on the correct utility tariff (which determines the rate you pay). Regulated utilities typically offer anywhere from 3-10 tariff options for their commercial customers. It’s important to properly match your electric needs profile with the appropriate tariff. We’ve seen clients save thousands of dollars simply by switching to the best tariff for that profile.